This reader introduces intermediate Latin students to Catullus, Horace, and Ovid. It offers a transition to reading these authors by presenting slightly modified versions of poems before the students read the authentic Latin verse as review. Vocabulary, reading helps, grammar reviews with exercises, and discussion questions are included, as well as sections on metrics, poetic devices and a complete glossary. Newspaper Clipping of authors [Breuker and Weinfeld], click to view PDF of article. 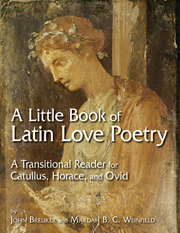 A Little Book of Latin Love Poetry: A Transitional Reader for Catullus, Horace, and Ovid is suitable for intermediate students of Latin, gently introducing authentic works by Catullus, Horace, and Ovid. The book is divided into two parts. In the first part, students read adapted selections of poetry. A biographical introduction to each of the three authors precedes the poems. In the second part, students read the unadapted versions by the same authors. The first part of this little reader contains extensive vocabulary on the facing pages, called "Reading Vocabulary," along with textual notes to aid the student in understanding aptly termed "Reading Helps." Additional notes about tricky grammatical and syntactical points are listed under "FYI." But the first part of the book does not limit itself nor the student, to untangling the Latin. Following each selection are questions in which the students perform grammatical and literary analysis of the text. As a further aid to the students on the journey between simplified Latin and unadapted text, following each selection is a "Rapid Review" of grammatical topics often troublesome for intermediate students. This review does not extend to every topic introduced in previous Latin courses that students are likely to have studied. Nor does it attempt to mire students in page after page of advanced grammatical concepts. The review sections are efficient and adequate to the needs of intermediate students. In the second part of the reader, students read unmodified versions of the same poems that they read in the first part. Textual notes to aid in student understanding, called "Textual Matters" and open-ended questions, or "Points to Ponder," follow each selection. The Appendices contain information that some teachers will find indispensable, and other teachers may wish to introduce to students later on. These appendices are 1. a timeline of the authors and events relevant to their lives; 2. a list of poetical devices and literary terms; 3. a brief discussion of meter; 4. a short grammar and syntax; and 5. a bibliography. There is also a Latin-to-English vocabulary at the end of the book. Students are not overwhelmed by the inclusion of too many poems, adding to the appeal of this useful transitional text. Teachers in schools that offer AP Latin courses will be glad to know that most of the poems in the book are on the AP Latin Literature Syllabus (syllabus available at www.collegeboard.com). The exceptions are Horace Odes 111.26 and Ovid Amores I.5; the inclusion of poems not taught in the AP courses adds variety to the students' experience of Latin. One of the more useful features of the text is the map of "Places Mentioned in A Little Book ofLatin Love Poetry" that gives students much needed geographical context for the poems. There are numerous small illustrations; sadly, they are not labeled as to source for students who may wish to see the original. Still, these illustrations give the student some visual "hooks" on which to hang their newly gained understanding of the poems. A quibble with the book is that subjunctive charts are not included in the grammatical appendix. It should be noted that present subjunctive charts are included as a rapid review. A more minor quibble is with the very small size of the font throughout the book. Teachers may wish to refer to the accompanying Teacher's Guide. A Little Book of Latin Love Poetry: Teacher's Guide by the same authors, John Brueker and Mardah B. C. Weinfield (ISBN 9780-86536-636-3). The Teacher's Guide contains large text versions of the poems, suitable for making overhead transparencies, literal translations of the poems, suggested answers to the questions and exercises, and what I found very helpful-large font versions of the poems with scansion marks indicated, also suitable for making overhead transparencies. At the end of the Teacher's Guide are suggested projects for alternate assessment, with grading rubrics. Teachers of the classics are often told that Latin is a "dead language." The implication is that the study of Latin is irrelevant to the needs and experiences of modern society. The use of this transitional reader can serve as a reminder that love as a poetic theme, and indeed, as a life experience, transcends language, spans cultures, relates generations, and traverses millennia. Breuker and Weinfield's A Little Book of Latin Love Poetry. A Transitional Reader for Catullus, Horace, and Ovid (or, as it is referred to throughout the book and this review, the Libellus) is intended to take the late high school or early college student from reading modified Latin originals to translating and interpreting real texts of canonical authors. It is a pleasantly designed book, provided with well-balanced descriptions of the three authors Catullus, Horace and Ovid and alternating passages of text with sections of grammatical review. The selection of poems may seem overly traditional at first glance. There is Lesbia and her sparrow, and Lydia and Corinna, just as we are used to seeing them in other anthologies -- but then, the aim of this volume is not to provide an all-round introduction to either of these authors. The amount of text discussed must, in order not to overwhelm the student using this book, be drastically limited to include highlights only, and the introductory descriptions of the three authors give a brief overview of other works, indicating the many different types of poetry they wrote. Several poems are first presented in a modified form, and later as unmodified texts, allowing us to thematize the transition from adjusted materials to authentic Latin, a distinction too often blurred in teaching materials aimed at beginners. The Latin text is based throughout on the Loeb editions of Catullus, Horace and Ovid — a choice easily motivated by the accessibility and wide spread of the Loeb series, and in keeping with the editors' notes on accessibility of grammar handbooks (p. x). While the lack of textual apparatus limits the use of some of the Loeb volumes for more advanced students, the unmodified passages in the Libellus nevertheless raise awareness of issues of textual criticism in a way suited to the book's intended readership. The introduction to the first unmodified poem in the book, Cat. 51, clearly states some of the problems met by editors and readers alike both when establishing and reading Latin texts, and indeed the combination of modified and unmodified texts could be used to illuminate such problems further in a class-room situation. Throughout the first half of the book, each section of a poem is supported by reading vocabulary, and hints for translation. Study questions both on linguistic comprehension and literary interpretation ('points to ponder') are provided for modified as well as unmodified poems. While the division between the two final items is not always clear-cut, the interpretational questions generally help the student delve further into the texts, and they would be an excellent tool for prompting further class-room discussion. In terms of compliance with current research on Latin love poetry, it is heartening to note that even at this level, there is frequent mention of the use of various poetic personae and that the narrator of the poem is not automatically to be equated with the real-life author (so for example on Hor. Carm. 3,9, p. 43). There could, however, have been room for further discussion of what this might mean for the tone and interpretation of the texts, particularly in the 'points to ponder'. Still, the combination of authors and texts selected can easily be used as a spring-board for wider discussion of traditions and topoi of Latin love poetry. For instance, the inclusion of Hor. Carm. 3.26 and Ov. Am. 1.9 and the 'points to ponder' provided for these poems draw the reader's attention to the notion of the lover's warfare, and prompt the reader/student to consider the efficacy and implications of this metaphor. The study questions are also most helpful in training the student to recognize and analyze rhetorical and poetical devices such as metaphors, metonymies, alliterations, etc, thus creating a solid foundation for more in-depth interpretations. Such terms are handily listed and explained in a reference appendix at the back of the book. Another appendix deals with meter and scansion, and the reading vocabularies continually include information on quantity. In the unmodified poems, tricky passages have been provided with marks to help explain the metrical pattern, which is bound to ease the transition to reading authentic material further. As this book is explicitly intended as a teaching work, it is worth pointing out that the text passages have been printed in large type, leaving plenty of room for making notes around and between the lines. The grammar review and exercises also come with ample scribble room, sometimes even slightly excessively so -- pages 6, 14, 22, and 40 are entirely blank. The exercises inventively recycle vocabulary and phrases from previous texts so that the student gradually can familiarize her/ himself with language typical of the genre. The Latin-English vocabulary at the back of the book should also be eminently helpful. In fact, my main quibble with this book has little to do with its stated aim of easing the transition to reading actual Latin poetry, which, in my opinion it does very well. Instead, it concerns the use of illustrations: throughout the book, the text is interspersed with various illustrations. There are photographs of well-known ancient sculptures like Cupid and Psyche (p. 17) and busts of Julius Caesar and Octavian, but also a vast number of reproductions of Victorian paintings and drawings by or in the style of Alma-Tadema. The odd subtitle to these illustrations points out that one can not be entirely sure that it is indeed Catullus who is depicted reciting to a rapt audience (p. 3), but for the most part, there is little to indicate that these are, in fact, not snapshots from ancient Rome. In a book intended for a readership with a still limited knowledge of the ancient world, this strikes me as unnecessarily confusing, something that could have been easily remedied with more generous subtitling. That said, this is a quite enjoyable 'little book' with a combination of attractive design (the front cover features a colour reproduction of a Roman wall painting) and easy-to-use texts and exercises. With the bibliographical references provided, it would work very well as a basis for independent study, and it would come in most useful in the classroom. Bolchazy-Carducci Publishers is a premier publisher of Latin language instruction materials and literature. One of their latest efforts to produce skill and fluency development in Latin is A Little Book Of Latin Love Poetry: A Transitional Reader For Catullus, Horace, And Ovid, a collaborative effort by accomplished academicians John Breuker and Mardah B. C. Weinfield. Comprised of selections from six poems by Catullus, three poems by Horace, and two poems by Ovid. All of these poems are provided in authentic Latin. Special features include opposite-page vocabulary and reading helps; thirteen 'Rapid Reviews' with exercises on key points of grammar and syntax; two 'Major Reviews' with drills on infinitives and participles; and a 'Final Unit Review' which encourages re-reading all of the poems in their unmodified form, along with notes on 'Textual Matters' and 'Points to Ponder'. Enhanced with appendices providing timelines for the 3 poets, 'Poetic Devices/Literary Terms, Metrics, Latin Grammar and Syntax, a bibliography, a glossary of proper names, and a full Latin-English vocabulary, A Little Book Of Latin Love Poetry is an ideal and thoroughly 'student friendly' supplement to Latin Language instruction curriculums. My holidays were considerably lightened by reading your new book [A Little Book of Latin Love Poetry]. It is excellent and you are to be commended highly. The need for transitional books for beginning Latin students has long been felt, but very few have undertaken the task, and many of those who did, shouldn't have. Your book, on the other hand, should be a great gift to both teachers and students. The poems you have chosen are quite good in themselves, of course, but your comments, helps, and questions make them much more accessible than do usual commentaries. I hope the book will be hailed as the success that it is. And I am quite proud to have been a part in your education.